Solid Construction If you are a heavy chess player you can relate to this. Having played chess for nearly 30 years, I have played chess on just about every surface and structure. Let me tell you, there is nothing more annoying than playing chess on a flimsy table and having it rock under you every time you go in for that crucial move! ï¿½Harold, you were right when you said this table was your most solid table, my son and I play blitz chess and the table is rock solid throughout the match. -Jason Greenblatt"
Solid Oak Wood and Precious Veneers Construction There is nothing nicer than having something to look at while playing an easy game of chess with an easy opponent while you wait for your turn. Iï¿½m pleased to say that this table is not an exception. Starting with the frame of the table, solid Oak wood is used to make it sturdy and solid. The actual board is made with exotic rosewood and the light squares feature Birdseye maple creating an awesome combination that is sure to please your eyes every time you look at the board. The playing squares are separated from the space around them by a unique veneer insert. To top it off the board features a subtle matte finish that is easy on the eyes. Why do we use Oak Wood for this table? We have found that for this particular finish Oak retains the color the best! the great thing about two drawers, is that I can store not only my pieces but my openings and strategies books right there. It comes in handy when analyzing my games -Michael Overton"
Felted Drawers Thatï¿½s right, not only does the table have two drawers, but also they are both felted with billiard cloth. How many times have you placed your chess set somewhere only to find it scratched? That wonï¿½t happen here! ï¿½Not all my sets are protected by their own boxes, so the felted drawers was a nice touch! -Rene Gomez"
Slide out/ Flushed Cup Holder This is one of my personal favorite touches. Not only does this nice little cup holder keep your favorite drink out of the way (avoid those spills! 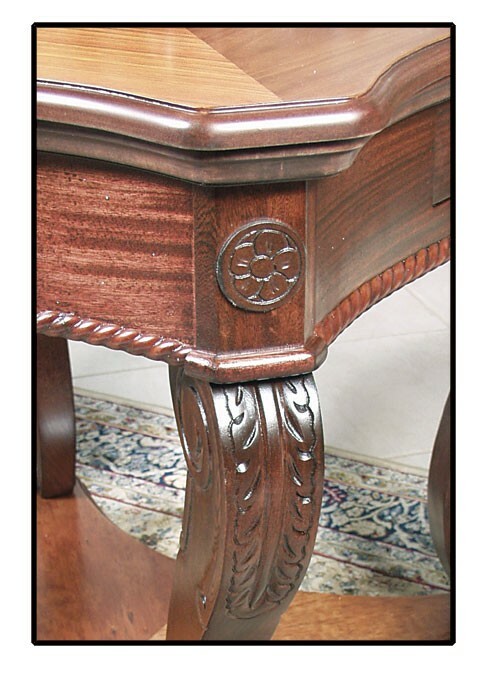 ), but it also protects your table finish! This is one cool feature that all your friends will talk about! Double Platform Construction What is unique about this design is the platform at the feet level. Besides giving the table an overall better look, it adds to the tableï¿½s stability. Brass Hardware We didnï¿½t skimp on the hardware either. The table features beautiful brass hardware. A note on the over all designï¿½ The table as you can see from the pictures is just absolutely breathtaking. Besides from the obvious features I have highlighted above, it also features beautiful hand carvings, curvaceous legs, and other accents that can be appreciated by looking at the pictures. Remember this table is mostly hand-made and extreme care and time is invested in this piece of art. ï¿½You were right when you said the pictures do the table no justiceï¿½ we are so pleased with our table. It seems to be the best conversational piece in our home! -The Stillinger Family"
A final word on the table and chairsï¿½ The chairs are also a work of art. Made out of solid Oak, with a dark cherry finish, they are strong and sturdy and feature a nice fabric (if you prefer your own fabric, mail it to us and we will re-upholster for a small charge). Also, the table and chairs are made of solid trunks of wood! Nowadays, furniture (even high quality made in the USA) is made with pieces of wood that are then glued together. Obviously you cant carve a whole table and chairs out of a trunk, however the main pieces (legs) are solid wood! ï¿½Living out here on the west coast, there is a lot of cheap furniture from Asia. I was impressed with the superior quality of the chairs and table. Keep up the good work... -Alec McGrath"
Shipping the whole thingï¿½ Right about now you might be wondering just how do we ship the thingï¿½ Well, first, the table is packed in its own box with all sorts of padding. The chairs are each put in a box. The three things are then put on a pallet, wrapped in plastic wrap and then the whole thing is strapped with nylon straps onto the pallet. The whole thing is then delivered via Freight Forwarder to your location. ï¿½ï¿½ regarding the packaging of the table, you guys have done a superb job. - Jimmy Schearer "
The Measurement details Table weights approx 50 pounds and measures 33ï¿½W x 33ï¿½L x 30ï¿½H. Squares are 2 1/4" x 2 1/4"
Assembly The table comes 90% pre assembled. The amount of assemblage you will have to do is minimal. You will have to put the legs in place, tighten some bolts, and then put the bottom platform in place. Backgammon Upgrade Available As an added benefit, you can upgrade to Backgammon on this table. Guess what? 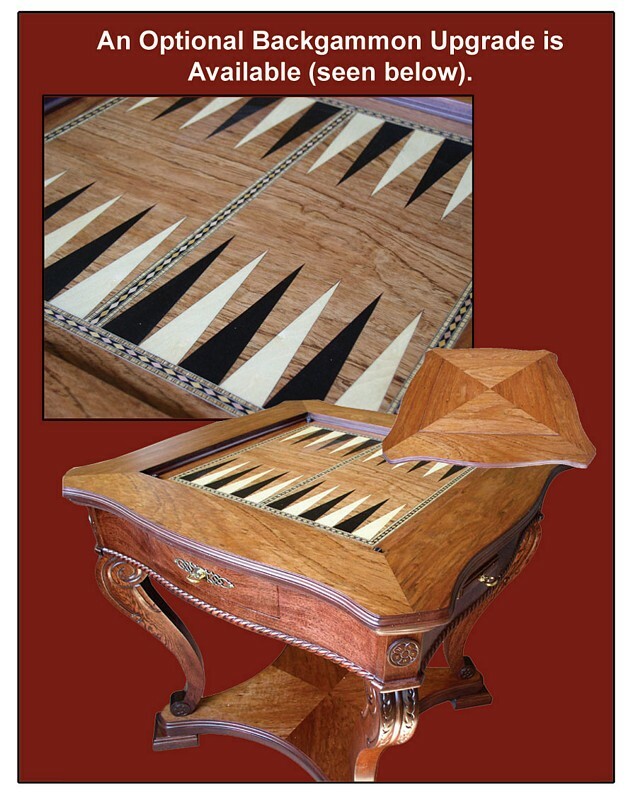 Not only is it backgammon, but it would also server as an occasional table, you can actually flip the chess board over and have a nice occasional table that is simply that... a Table! The backgammon board is recessed about an inch, so the dice and pieces will stay nice and neat while you play. Also, you should see the detail of the backgammon board. AMAZING! Exclusivity We only make about 8 of these tables a month! How can we sell such a high quality table for such low prices? We work on economies of scale. When you buy from us, you are buying directly from the manufacturer. Not only are you cutting out the middle man, but since we make all sorts of furniture, we buy our materials in large quantities which allow us to offer you a superior product at a much lower price. Don't let the low price fool you, you can find a table and chairs like this selling at a retail store for about $2500.00. You are getting a SOLID Superior quality product! All backed by our money back guarantee, unheard of in the furniture business. Now, as you can see, the price of $749 for the table and $1149 for the table and chairs is EXTREMELY low and in a few days the price will either go back up to $1,399 and $997 respectively! Or we will simply sell out of them!ï¿½) Also, a few of the marketing guys warned me personally against selling this set so cheap. You see I know there are going to be some people that wont want to purchase this set because they think it must be of low quality because of the low price. That is simply not true. Please donï¿½t let that old saying get the best of you. Are we Crazy??? 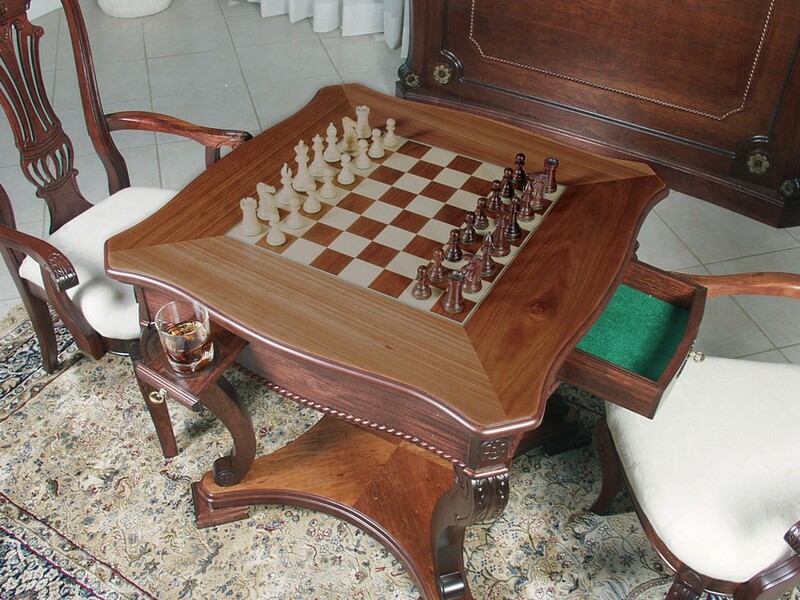 Look selling this chess table and chairs so cheap is already a pretty crazy idea and after the date specified below, we simply cannot guarantee you will get this set at this low price. ORDER NOW! Lock in the low price because supplies are limited and at this price this set is sure to fly! 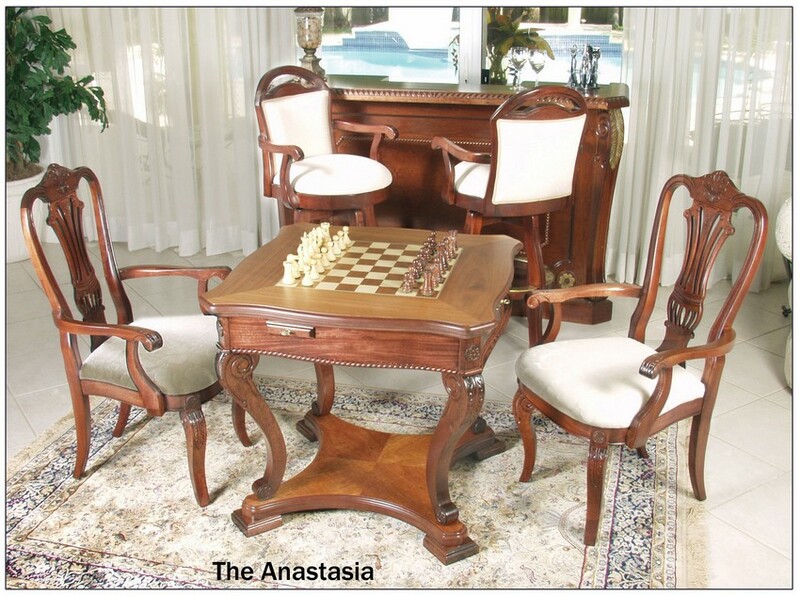 Remember you are getting an extremely high quality chess table and chairs at an incredible price. I don't think you will find the high quality woods, design, and durability of a table like this anywhere else at this low low low price. CHESS PIECES ARE NOT INCLUDED. Measurements: Table measures 33" x 33" x 30 high. Chairs Measure: 40" high x 25" x 25".